Plas Newydd is a fine moated manor house listed Grade II* and dating back to 1632, although the site had supported an earlier house. Extended and remodeled subsequently, the property is constructed of stone under steep pitched roofs with tall chimneys and mullioned windows. Inside, the house retains many original features including the gargoyle over the front door. The impressive dining hall has an inglenook fireplace and off here is the large kitchen/breakfast room; what is thought to be a former priest’s hole now serves as a cloakroom. The first floor drawing room has a study recess and two fireplaces, and the panelled staircase continues to the second floor landing, off which is the master bedroom suite. Across from there is an oak-panelled double bedroom and a family bathroom. The top floor has two further double bedrooms served by a shower room and a separate linen room. Outside, the outbuildings were remodeled in the Gothic style at the end of the 19th century and are also listed Grade II*. The two stone cottages are ideal as secondary accommodation, or as offices. The domestic outbuildings could also be incorporated into the ground floor accommodation, if the planning permissions were agreed. The front of the house has a part-walled south-west-facing garden with a grotto and well, while behind the cottages is a lawned garden. Lawns leading alongside the drive lead to a small lake with an island bordered by mature trees. The parkland is suitable for grazing and is bordered by the River Llifion. The whole extends to 24 acres. 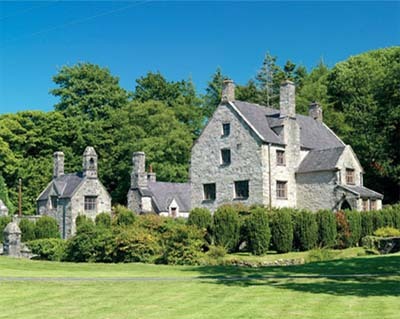 Plas Newydd is situated in Coastal North Wales six miles to the south of Caernarfon on the edge of the Snowdonia National Park. Bangor is 15 miles and Chester 72 miles. The guide price is £.25m. For further information please contact Jackson-Stops & Staff on 01244 328361 or visit www.jacksom-stops.co.uk.